At Tara Lodge, Belfast we are delighted to announce that we are now offering the luxurious Orla Keily Geranium Bath & Body range in all our room types from September 2015. 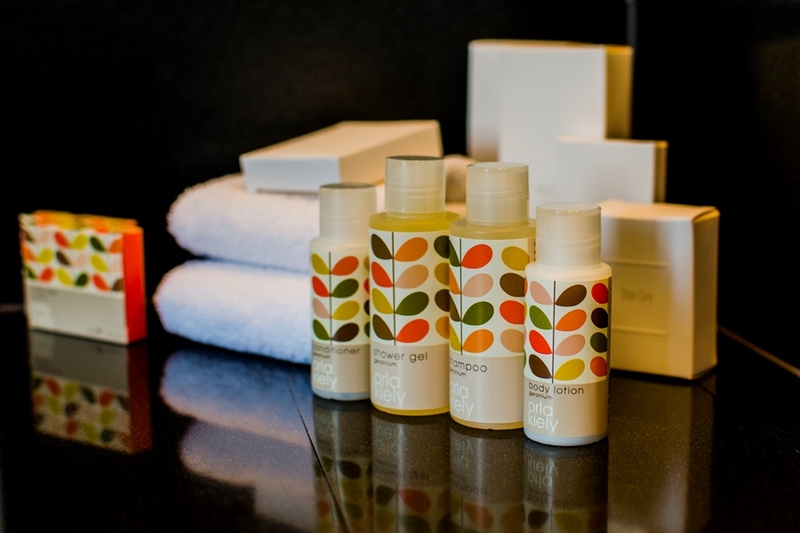 We are the only property in Belfast to offer this exclusive range of toiletries with the distinctive Orla Keily stem print. Already the luxurious, fragrant bathroom items are proving a great success with our guests. The Orla Keily toiletries collection is a unique unisex fragrance containing a blend of 10 essential oils that will appeal to all our guests ensuring a fabulous cleansing experience. This exclusive range is a great addition to the Tara Lodge brand as we continue to develop our product ensuring we exceed our guest expectations every time. 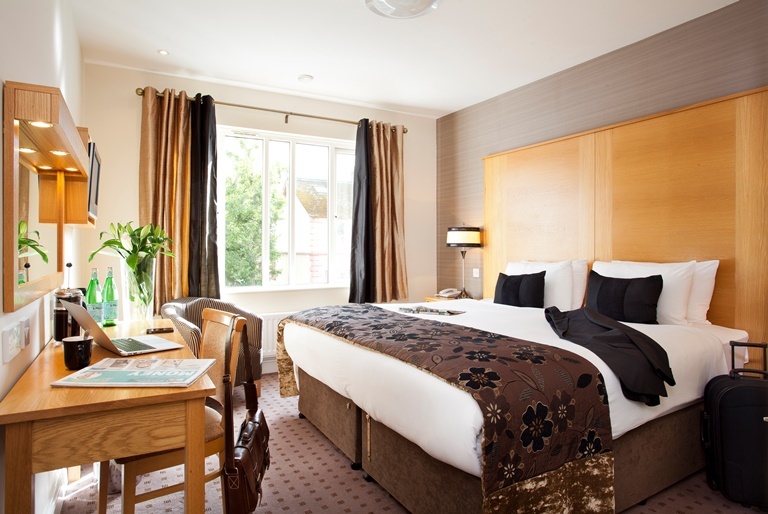 Our boutique hotel bedrooms offer offer ultra-comfortable King Koil hotel beds with sumptuous chocolate & gold soft furnishings and stylish & perfectly designed pale, oak furniture, with all the comforts of home. 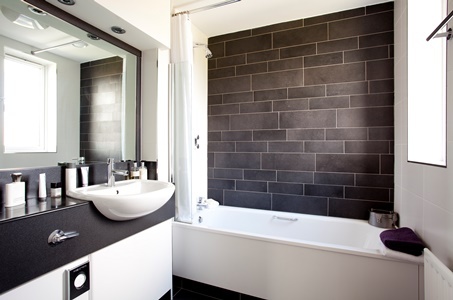 Our luxury hotel bathrooms with chrome Touch fittings and a soothing charcoal and white design are complimented by the luxurious Orla Keily Geranium Bath & Body range. With the distinctive Orla Keily stem print design and the beautiful scent including geranium, eucalyptus and clary sage our toiletries are sure to relax and refresh the mind. Indeed the super Grohe power shower is sure to leave you refreshed and rejuvenated. Orla Keily, an Irish fashion designer, based in London is famous for her retro patterns which are quirky and sophisticated. Orla Keily has grown into a global brand with a range that includes ready-to-wear, stationary, travel and homeware as well as home fragrance and bath & body. Orla’s love for all things from the 1950 & 1960’s inspired her to create charming and uplifting prints with the signature ‘stem print’ the most instantly recognisable. Contact our award winning reception team on 028 9059 0900 or by email to info@taralodge.com to reserve one of our stylish rooms to enjoy our new exclusive Orla Keily range. Go direct and book the best hotel deal online with rates from just £78.00 for an Annex Double room with a full, freshly cooked breakfast, high speed WiFi and access to our secure car park. We look forward to hosting you at Tara Lodge this autumn. Ranked 12th in the Top 25 Hotels in the UK.